The islands of the Philippines sit roughly three thousand kilometres almost due north of Darwin, and their popularity as a tourism destination has grown steadily over the past ten years, with more than 250,000 Australians estimated to have visited in 2017. With this in mind, thirteen personal travel managers (PTMs) were invited to be part of a group of thirty travel professionals on an eight-day famil of the island provinces of Cebu and Bohol, hosted by the Philippine Department of Tourism and Philippine Airlines. 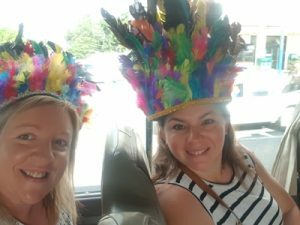 After arriving in Cebu, the group spent their first morning participating in a “travel exchange”: a series of B2B sessions with suppliers that were either targeting or already active in the Australian market. 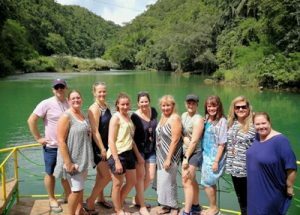 A leisurely lunch cruise on the Loboc River for (L-R) TravelManagers’ Mark Devers, Gail Hughes, Corinne Saunders, Emma Ross, Wendy Krukowitch, Michelle Schulze, Sarah Bird, Julie Painter, Karina Petrovics and Adela Backhouse. Wendy Krukowitch, who is representative for Watsonia, VIC, says she appreciated the opportunity to gain a better understanding of the country’s different regions, and the various types of accommodation and touring available to her clients. From here, the group spent an afternoon carrying out various site inspections, including popular resorts on the neighbouring island of Mactan, and wrapped up the day with a Filipino-style buffet dinner. It was then time to divide into two groups: the first of which headed to the south-eastern end of Cebu. According to Michelle Lehn, who was one of the PTMs in this group, one of the highlights of their itinerary was the chance to get in the water and interact with whale sharks in Oslob. Meanwhile, the other group spent two days exploring several of the islands further east from Cebu, including Bohol, where they enjoyed a lunch cruise on the tranquil Loboc River, and Panglao, which is famed for its beautiful beaches and incredibly diverse marine life. 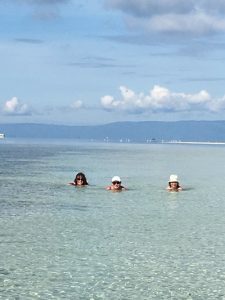 Using their famil down-time to fully appreciate the destination are TravelManagers’ Julie Painter, Michelle Shultz, Emma Ross (L-R), pictured here at Virgin Island in Bohol. 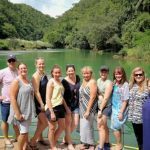 As well as the undeniable scenic highlights of their time in the Philippines, many of the famil participants also identified a further reason that they intend to return in the future, including Julie Painter who is representative for Mount Colah, NSW. “The Filipino people are the most incredible, giving and heart-warming culture I’ve experienced in Asia – you can’t help but return the smiles, everywhere you go,” she explains. Both groups reconnected back in Manila, where they were hosted for a second series of B2B supplier workshops. According to Michelle Lehn, representative for Engadine, NSW, these workshops gave attendees the opportunity to broaden their destination and product knowledge beyond those they had been able to visit during what amounted to an action-packed itinerary. TravelManagers’ Executive General Manager, Michael Gazal, says the company was not surprised with the feedback received from PTMs explaining that first-hand knowledge is invaluable in destinations that are still relatively unknown to the Australian market. 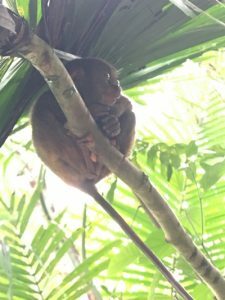 As well as enjoying the Philippines’ stunning beaches, TravelManagers PTMs were able to get up close to the world’s smallest primate: the tarsier. It’s a statement of fact that is emphasised by the PTMs themselves, including Karina Petrovics, who is TravelManagers’ representative for Mittagong, NSW. Krukowitch is one of the many participants who has confirmed that she will be returning to the unique destination in the future. For more information or to speak to someone confidentially about TravelManagers please contact Suzanne Laister on 1800 019 599.